Who was it that gave back-to-back World Champion Mike Hakkinen his greatest gift? The telegenic Erja, his loving wife and leading lady in every Formula One TV broadcast? Jacques Villeneuve and David Coulthard, for gifting Mika his first victory at Jerez in 1997? The doctors who gave Mika back the gift of life at Adelaide in 1995, when they administered a painful tracheotomy at the scene of his near-fatal accident? Ron Dennis, who has seen Mika through thick and thin? Or, incredibly, is it Michael Andretti, son of Formula One World Champion Mario Andretti, and himself a CART champion in 1991 and in the running again this year for the CART Championship, who had a depressing not-quite-complete season in Grand Prix cars in 1993, and when it all went up in smoke, turned his McLaren-Ford over to then-test driver Mika Hakkinen who, it can now be said, spectacularly turned Andretti's loss into his gain? It all began for Michael in the whirlwind year of 1991, when he would win a record eight races in CART, be on pole eight times and ultimately be crowned CART Champion, and when he raced sports cars at the 24 hours of Daytona, reflecting his father's versatility. In other words: he was hot, like Juan Pablo Montoya is now, and as the 1992 season unfolded, the young Andretti was thinking about Formula One. Michael and his father Mario had contacts with both McLaren and Ferrari (Mario had driven for Ferrari in the early 1970s), but Michael ran in CART again in 1992 and the focus of his planning to switch to Formula One became the 1993 season. Meanwhile, over in Formula One, Ron Dennis at McLaren was having a difficult 1992 season on all levels: performance of the team was down, prospects for 1993 did not look promising since Honda had announced that it was exiting Formula One, and McLaren's star driver, Ayrton Senna, was making noises about packing it in at McLaren. Unlike today, when drivers would fall all over themselves to join McLaren, the Gold Standard of Formula One teams was in a bit of a shambles in 1992, after a long run at the top. For 1993, Williams had the best engine, the Renault, and everyone wanted to be there, including Senna, who could see that Ron Dennis and the team would be treading water come 1993, having lost Honda and its world-beating V12 engine. Senna is rumored to have offered to drive for free for Frank Williams but his archival, Frenchman Alain Prost, got the nod from engine supplier Renault over Senna. With Senna temporizing over whether he would sign up again with McLaren for 1993, Dennis was keen to lock in somebody of substance. By September 13th 1992, the height of the Silly Season at Monza, the announcement had come: Ron Dennis had dropped everything to venture forth to the wilds of Bloomfield Hills, Michigan, where he signed a contract with Michael Andretti to drive for McLaren in 1993, with a further two-year option if things worked out. Important issues like what engine the McLaren would use were still up in the air, as was Senna's situation. By December 1992, things were beginning to come together. McLaren had finished up the season strong; Berger had won the Australian Grand Prix at Adelaide, the last race of the season, and had placed second in the prior two races at Estoril and Suzuka. And Michael began his indoctrination, testing last year's McLaren-Honda V12 at Barcelona and at Paul Ricard, with mixed results. But also in late December 1992 came the bad news: Renault definitely would not be coming to McLaren. Instead, Ron Dennis was stuck with a Ford V-8 for Michael's rookie year, 1993, and it was a Ford customer engine one spec behind the one to be used by Michael Schumacher and Ricardo Patrese at Benetton-Ford. Dennis was so desperate during this period that he tried to buy the French Ligier team - the only other team that had the rights to use the Renault engine - but that stratagem also failed, because Ligier's sponsor Elf refused to step aside and let Ron's sponsor Shell pump the gas. When the dust settled, McLaren found itself in 1993 with the same arrangements Sauber has had with Ferrari these last few years, running the stepchild Ford engine. One positive ingredient in all this: McLaren would have the engineering benefit of its business partner, TAG electronics, which strengthened the McLaren-Ford package by tricking it up with the driver aids then permitted in Formula One: active suspension, semi-automatic transmissions and fly-by-wire throttle, where there is no direct mechanical link between the pedal and the engine. Senna's antics, though, contributed to an uncertain December 1992. At the suggestion of fellow Brazilian Emerson Fittipaldi, Senna went to Phoenix to test Roger Penske's Indy car, signaling to Dennis that he was not the only fish in the sea. (And Senna had guessed right by the way as to what team to join; Emerson Fittipaldi would go on to win the Indy 500 for Marlboro-Penske in 1993.) Remember, this was a time of cross-pollination between Formula One and the Indycars, with Mansell jumping ship after winning the 1992 World Championship for Williams and taking Michael's seat at Newman/Haas, ultimately becoming the first rookie to win the CART championship in 1993. Enter Mika Hakkenin, who was leaving Lotus, and had also intended to go to Williams-Renault for 1993 but was blocked from doing so by the Lotus team manager, who controlled Mika's contract. In order to resolve Mika's situation and avoid a lawsuit, Keke Rosberg, Mika's manager, found Ron Dennis on vacation in December 1992 in the French Alps, explained Mika's quandary and set up a meeting between Mika and Dennis. As they say, the rest is history. With the first race of the 1993 season scheduled for Kyalami, South Africa, Ron Dennis covered his bets and brought on Mika Hakkinen to be either teammate to Michael Andretti or test driver for McLaren, depending on Senna's decision. Surely, Andretti had been through enough years in racing to see the danger signs in an atmosphere of such tumult: new engine (late to arrive, only a month before Kyalami), new drivers, and limited testing with the new package prior to Kyalami, but he was already committed to see it through. In the end, what went wrong? Was it Michael? Was it the McLaren-Ford? Was it the team showing favoritism to Senna? Or was it just colossal bad luck, Andretti-style, something that had also plagued both father and son at Indianapolis, where they have together led tons of laps but have only one win between them, Mario's, in 1969? The conventional wisdom is that Andretti's main mistake was that he did not take his commitment to Formula One seriously enough, that he kept criss-crossing the Atlantic on the Concorde after every race instead of hanging out at Woking with Ron Dennis, leaving Mika Hakkinen to do the testing, and robbing himself of seat time and cultural bonding with the team. 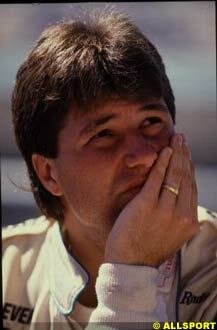 There were also changes in regulations that year that limited testing, which worked against a newcomer like Andretti. These pat explanations for Michael's inexplicably horrendous performance are accepted as gospel in Formula One circles; they are found in books and can be heard from people at Formula One factories. But these explanations simply do not wash and are mostly at odds with all we have seen from Andretti during his now long and distinguished CART career, where he has never been known as a slacker. And he did have family reasons at that time for wanting to stay close to home: Michael was by 1993 the father of two young children, 6 and 3, so presumably he wanted to be with them as much as possible, thus the infamous Concorde frequent flying. So what happened then? Was it just an early form of the Zanardi Experience, where a brilliant CART career just did not translate into a successful Formula One ride, because the cars were just too different or the driving techniques too dissimilar for quick adaptation? But if that were the case then what about Jacques Villeneuve, who won the Indy 500 and the CART Championship in 1995 and was winning Formula One races for Williams by 1996? 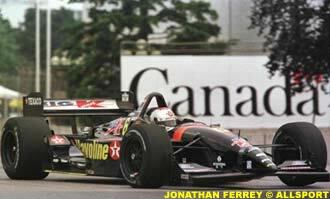 And what of Mansell, who successfully made the same transition as Villeneuve but in reverse order? Can Michael be all that less talented than these two? In some ways, with the benefit of historical context and with more public knowledge today as to how Formula One teams actually operate, we may be in a better position to judge now what went wrong than was possible to do at the time these events were occurring in 1993. As Rubens Barrichello and David Coulthard have discovered, there is always a Team Leader and clearly Ayrton Senna, even in his same uncertain state as of 1993, would have been No. 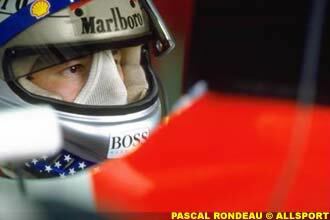 1 at McLaren, based upon the phenomenal success he had brought to the team from 1988 through 1992. To be sure, Senna's itchiness to jump ship in 1993 would certainly have solidified his receiving preferential treatment from Ron Dennis and the team; by contrast, Michael was a distant second, a kid with a famous last name and a Championship in that lesser open-wheel series Across The Pond but certainly no Senna. Moreover, the McLaren-Ford, as feared by all concerned, was apparently no great shakes even in Senna's hands; Senna came back to McLaren on a race-to-race basis but managed to pull out wins only in Monaco (where he was a past master), at Donington (where his sheer spellbinding talent in the rain won the day), at his home race in Brazil (also in the rain), at Suzuka (again in the rain), and at Australia, his final race for McLaren and, significantly, McLaren's last win until Jerez in 1997. During the rest of the season, even Senna was outclassed by Alain Prost and Damon Hill in the Williams-Renault. In short, a strong case can be made for the proposition that Michael was a backbencher on a team that was then in decline, running a year-old engine, and that was the most likely explanation for his lackluster season. Even if Michael had pitched a tent at the factory in Woking, it could not change the horrible truth: he had opted to join a great team that was having a bad year and that we now know was going to continue to flounder for a few more years to come. And the fact that Michael was dealt inferior equipment by McLaren took its toll as Michael's 13 unlucky races wore on. Michael's ignominious first race at Kyalami could be put down to the team's lack of preparation: in what should have been a triumphant return by Michael to the track where his father Mario had taken his first Grand Prix win for Ferrari in 1971, what Michael found when he attempted to start his very first race was that the clutch did not grab, a fairly fundamental mechanical problem. He stalled it, had to be pushed to the pits and began the race one lap in the hole. Hurrying to make up for his abysmal start, Michael went out on Lap 4, after hitting Derek Warwick, who was able to continue and finished seventh in the Footwork/Mugen-Honda. In Brazil, two weeks after the South African race, Andretti again flubbed the start after a promising qualifying session, which ended up with Senna third on the grid and Michael in fifth. As Andretti fumbled the shift from first to second (this time, it was driver error, not the clutch), the rest of the field engulfed him and a driver that would turn out to be his nemesis all year long - Karl Wendlinger, who had qualified in eighth place in his Sauber - made a move toward Andretti, which led Andretti to move right in front of Gerhard Berger, who had qualified way back in thirteenth and was making up places in a hurry. The result was a spectacular crash when their wheels locked, and the cars cartwheeled into the first turn. Michael was helicoptered to the hospital for a check-up but neither he nor Berger were seriously injured in the shunt. At Donington Park for the now-legendary European Grand Prix, where Ayrton Senna passed five cars in the first lap in a driving rain, Michael had again qualified reasonably well in sixth place. But in the course of his own first lap histrionics, Michael tried to make an exuberant and low percentage pass on Wendlinger, who had qualified fifth, and ended up putting both the McLaren and the Sauber into the mud and out of the race. To make matters worse, Michael's dad, who was an active CART driver at the time, had come to the race (even the late Princess Diana was there that day), and Michael had been better in warmup than Senna. But it was Senna who turned in one of his most memorable races, while Michael had embarrassed himself with a boneheaded move against Wendlinger, who he kept running into all year long. Box score thus far: three races, three wrecks. No wonder Michael wasn't hanging around Woking male bonding with the mechanics on Monday mornings! At the next race, at Imola, Andretti again qualified sixth and his shadow, Wendlinger, was again beside him in fifth. To this point in the season, Michael had put in exactly four race laps. He finally put in 32 laps at Imola before falling victim to a spin after racing with Wendlinger for fourth place, possibly a spin induced by a suspension or brake balance problem not entirely of his own making, but nobody wanted to hear about that as he registered his fourth DNF in as many races. In the Spanish Grand Prix Michael finally completed a race, finishing fifth amongst the Big Boys: Prost in first in his Williams-Renault, teammate Senna in second and Schumacher and Patrese in third and fourth places, with their higher spec Benetton-Ford engines. Andretti had his first points. On May 23rd 1993, when Michael would normally have been a the Indy 500 watching the last day of qualifying (his father Mario was on the front row that year, and Mansell had qualified Michael's former K-Mart team car in the third row), he found himself at the Monaco Grand Prix, qualifying back in ninth, with the clutch taking on a life of its own at the start and upshifting prematurely, dropping the revs and dropping Andretti back, letting the slower cars get by him. After he gathered himself up, Andretti faced his next challenge, coming upon a gaggle of cars at the Loews Hairpin, where he hit Fabrizio Barbazza's Minardi and was forced to pit to replace the McLaren's broken front wing, another Haste-Makes-Waste miscue that put him at the very back of the field. Only a remarkable run up through the field allowed Andretti to finish eighth, though two laps down to his teammate Senna, who won his fifth consecutive and last Monaco Grand Prix that day. In Canada, mechanical gremlins struck again - a dead battery in this case - as the grid moved off for the reconnaissance lap. By the time the repairs were finished, Andretti was three laps down and would end up classified fourteenth in the race; it was a bad day all around for McLaren, as Senna also had mechanical gremlins and finished eighteenth with an alternator failure. At Magny-Cours, the transmission glitches that had presented themselves at awkward times all year long erupted again in qualifying, with the semi-automatic shifting mechanism taking on a mind of its own; Andretti qualified sixteenth as a result. But after yet another bad start, Michael passed many cars and finished sixth, just ahead of Rubens Barrichello in his Jordan-Hart, and also ahead of Andretti's current CART teammate, Christian Fittipaldi, who finished eighth in his Minardi-Ford. For Silverstone McLaren had a higher spec Ford engine and Andretti had high hopes, since he had some familiarity with the Silverstone track from testing there in pre-season. But then his qualifying attempt was spoiled by the rain and he ended up eleventh; in making up ground after a good start, Andretti spun off, again on Lap 1, by going for too much too soon, as he had at Donington. At Hockenheim, Michael again qualified poorly in twelfth, after experiencing mechanical problems not of his making and ended up going out on Lap 4, after tangling with Berger and bending the suspension. Berger continued and finished sixth, but Andretti was out. The nightmare that would not end continued at a withering pace. At Hungaroring, the fly-by-wire throttle failed as Andretti was making a run up though the field, from his qualifying position in eleventh to as high as fourth by Lap 15, when the charge ended, his seventh DNF in eleven races. Senna went out two laps later, also with throttle problems. At Spa, the comedy of errors continued, including a distressingly long tire stop during which the engine shut off. Even Senna had trouble at Spa, finishing fourth, almost a lap down; Michael finished eighth. The handwriting was on the wall by this time, as Italian-American Andretti took the grid at Monza for the Italian Grand Prix, where his father had clinched the World Championship in 1977 with Lotus-Ford, and where American Phil Hill had done the same for Ferrari in 1961. This was to be Michael's last race with McLaren-Ford, come what may. As had come to be expected, things conspired to limit Michael's practice time and he qualified ninth; Senna qualified fourth. But in the race, both McLaren-Fords had brake balance problems, causing both Senna and Andretti to spin out in the grass near the chicane. Senna could not resume after his spin, but Andretti was able to keep it going and, after pitting to remove the grass obstructing his radiators, Andretti proceeded to drive the best race of his Formula One career, fighting his way through the pack from twentieth to third (appropriately just nipping omnipresent Wendlinger who finished fourth), finally getting the chance to ascend the podium next to Damon Hill and Jean Alesi. Had Wendlinger - who had figured in at least half of Andretti's offs - been able to hold onto third that day at Monza, it would have been Wendlinger's highest career finish; instead, it was Michael's highest finish, so there must have been some satisfaction in achieving a podium for himself as well as denying it to Wendlinger in his last two hours in Formula One. Michael was out after Monza and Mika was in, permanently taking his place as a regular McLaren driver, a position he has now been in for eight years. While Mika outqualified teammate Senna at the Portugese Grand Prix in a hint of things to come, when it came to the race, Mika crashed out, following in Andretti's footsteps, and at Adelaide he went out after the brakes failed. But in the Japanese Grand Prix, Mika managed to equal Michael's best finish, mounting the podium at Suzuka, where Senna finished in first place and Mika finished in third. In the end, Andretti's year was every bit as bad as the confusing numerology suggested. Michael took to the grid in his No. 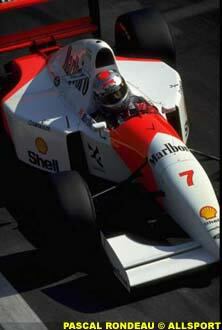 7 McLaren-Ford in 13 races, did not finish in 7 of the 13, and of those DNF's, 6 of the 7 were collisions or spins. He scored 7 points. Seven years later, Michael Andretti seems poised to make a stronger run for the CART championship than he has for years, which would make Michael a two-time CART Champion. After several years with the Newman-Haas team, he has announced that he is a "free agent" for next year and is looking for a way to run in the Indy 500 and perhaps become part-owner of a CART team. 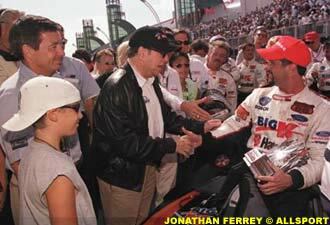 Plainly, Michael was then, and is now, a great driver, committed to his racing. Naggingly, then, it remains difficult to analyze how and why his one partial season in Formula One went so horribly wrong. Thomas O'Keefe © 2000 Kaizar.Com, Incorporated.